As I stood in the store on the day after Christmas, I was shocked to see an entire aisle of red- but not due to Christmas decor… hearts and chocolate was in abundance. Red boxes and bows and roses with splashes of pink were lined up, ready for the next retail holiday- Valentine’s Day! Since that felt like a bit of a rush to me, I waited a couple weeks before posting this fun Bible Verse Valentines printable. But the truth is that every day should be a celebration of God’s love! Have you ever wondered if God really loves you? I have. I could recite John 3:16 all day from the time I was just a child, but all that meant is that God loved the world. I mean, isn’t that a pretty big place? Everyone- in the whole world?! And I’m just one little, itty, bitty person in that world. How could I know that God loves me? Oh, He loves me alright. Loves me so much that He gave Himself for me. And He loves you just as much. Since Valentine’s Day is focused on love, I can’t pass up the opportunity to share the One True Love of the entire world. 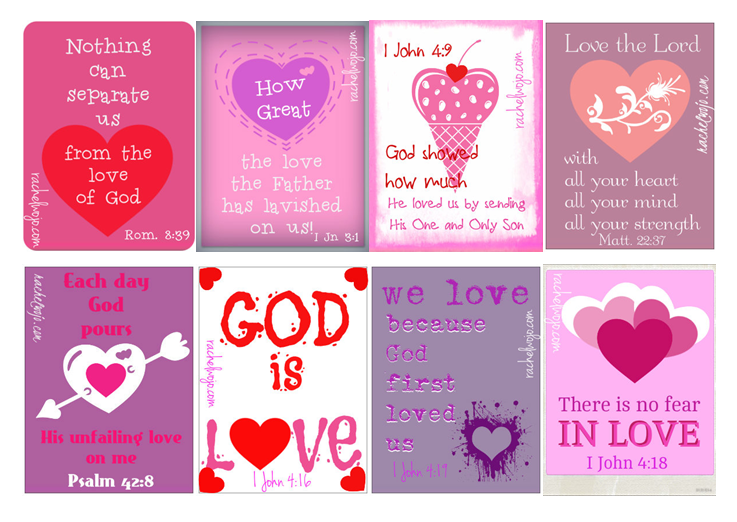 Today I’m providing a fabulous printable with these 8 Bible Verse Valentines you can print on one 8.5×11 sheet of cardstock. Click here to download the free PDF or on the graphic below. Enjoy and share with your neighbors and friends! I’d love it if you’d send the pics of how you decide to use the printable. Just submit through the contact page or send via any social media channel. 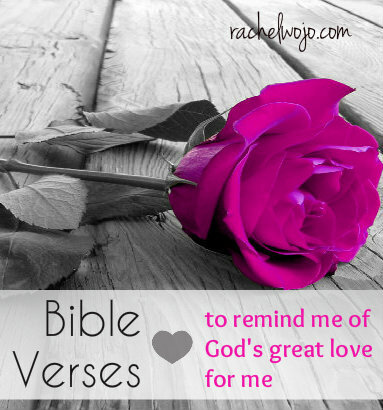 Do you have a favorite Bible verse that reminds you of God’s great love for you? I’d love it if you’d share it with us. ADDENDUM: OH Bible Challenge Readers!! How could I fail to ask you how you are doing this week??? It just hit me this morning- Tuesday! Bad leader, bad, bad leader. 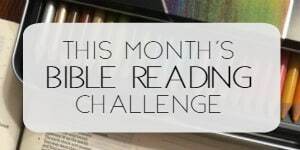 Won’t you please check in to let us know how the Bible Reading Challenge is going?? 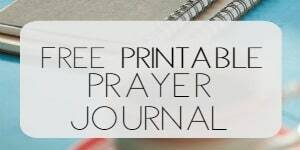 I am part of a group of women with students in college who meet once a month to pray for our children, and create a care package for them. In February we are to bring a valentine and something yummy for the box; I am going to print the valentines for their boxes. using card stock. Maybe glue a stand on the back. A small silk rose or any flower attached to front might be pretty…I’ll have to play with it a little. and I have to keep in mind….”less is more”…lol….sometimes I tend to get a bit carried away. I definitely will use these as a ministry tool! I can’t wait it give them out. Thanks! I will use them, and need to ponder exactly how. It is easy to bite off more than I can accomplish. A verse that speaks love to me is Jeremiah 31:3: Yes, I have loved you with an everlasting love; therefore with loving-kindness have I drawn you and continued My faithfulness to . These are great! I think my kids will love them and will want to use them as their Valentines this year! Thanks so much! My favorite verse that reminds me of God’s love for us is Zephaniah 3:17! YAY! thankyou for the wonderful inspiration. I am in South Africa and am always on the lookout for new ideas to make simple but attractive tracts. I think these would be great with a bit of “witnessing info” on the other side. I have never done any this small before… (4 to a page is my smallest so far) but I will try and tell you how they go. Enjoy, Erica! 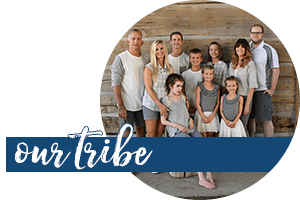 Would love it if you find a story of inspiration you can share with us from your valentine adventure! Thanks Rachel, I am looking forward to giving these out to the children and maybe adults at our church. Thanks for sharing. I love reading your blog for new ideas.